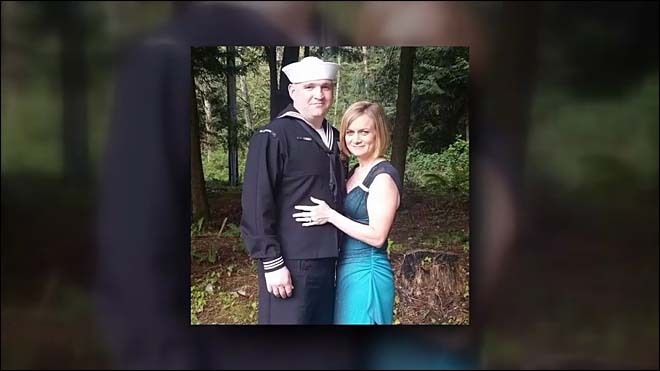 Petty Officer First Class Jared Knight was on his way home on Thursday night when a young man in a car made an unsafe lane change and hit his motorcycle. Although Mr. Knight was wearing his helmet and made an attempt to brake, he was severely injured in the accident. He was taken to Harborview Medical Center, but passed away from his injuries on Saturday. Mr. Knight was a sonar technician on submarines, a devoted volunteer, and a football and soccer coach. He is survived by his wife and four children. Detectives are handling the case as a criminal investigation, following a witness statement that the car that hit Mr. Knight may have been racing another car. The driver who hit Mr. Knight did stop and gave a statement to police at the scene, but the car he may have been racing against has not been found. Detective Rodney Green has asked anyone who might be able to identify the owner of a dark-colored Subaru WRX with 'Angry Bird' headlights to call 360-473-0148. Detective Green is confident that Mr. Knight was not at fault in the crash, stating, "Based on the marks at the scene he really knew how to ride a motorcycle. He definitely didn't go down on his own. It was the contact from the car. That's for sure." Mr. Knight’s family may also be able to recover civil penalties, although it may be some time before detectives can determine whether the unidentified car was also at fault in the crash. If you have been involved in a motorcycle accident, contact Davis Law Group.